I used to escape from the loud house-full of happy Philadelphia-area Italians into my grandmother's basement. Down I would float down over stairs that were wearied over the years into a flexing, barely perceptible bounce by playing shoes and late-to-work shoes and furniture-moving shoes. Down, I'd go, into the deep smell of earth, books, boxes and gently musty air that floated cool between cinder-block borders broken only by thick block glass squares in rectangular rows that let in just enough light to color the basement into more of a secret world than a scary place. My retreat spot lay over by the little book case filled with aging paperbacks standing at attention under the shoulder-to-shoulder pressure of each other. I'd sit on the carpet under rafters hung with aged and drying red peppers...but first, to re-inspect the weathered half-barrel that hung on the wall. It look very much like this more famous book. I'd open the clasp on the front and it would swing open to reveal gold-rimmed shot glasses and Scotch glasses and tumblers in neat semicircular rows, each half-sunken into its wooden nest. Just a peep, to see the secrets inside and to hear the echoes of parties that had been centered around it as my impossibly-young grandparents poured ice-tinkling drinks for guests whom I pictured to be composed of black and white movie flickers; the women trim and jaunty in their wide hats, like Lois Lane from the George Reeves Superman show; the men in double-breasted suits with hats cocked sideways. The laughter muffled itself as I pulled the sides of the barrel to; stopped as I fastened the clasp. Below crouched the book case, itself, swirled in antique yellow, its outer frame planed into symmetrical undulations, little circles carved into the corners by the cabinetmaker's hand. Sitting Indian-style (it was okay to call it that, then) on the old, green, sculptured carpet, I could see the book I had left from our last trip to visit Grandmom here in Northeast Philly. I'd left a toothpick in it to mark my place. 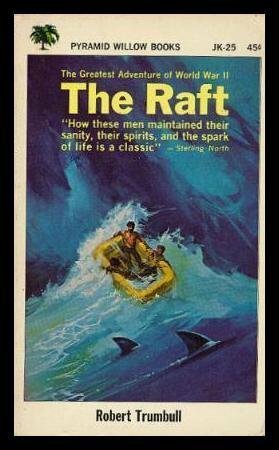 On the cover was a painting of four men in a life raft, sprawled and tumbling, mouths shaped into replica fear as they tumbled amid white-capped oil-painted waves. I opened it and fell back into its story of four American pilots shot down over the Pacific -- this book written decades before I was born by someone nobody remembers -- whose name might not even have been what was written -- but who managed to crank out solid pulp fiction for a living. The characters wielded names like "Nick Andersen" and "Captain Buck Blake" and they talked about cigarettes and "dames" as they snagged sea turtles and drank their blood or after they'd paddled off a school of tiger sharks. You could almost see the aesthetic way their shirts frayed; how they fiction-burned, instead of suffering under the misery of bubbling skin and cracking lips. They endured heroically in that silver-screen way. But I don't remember the story -- that one or any of the other dozens I read -- much. What I do remember is how I always noticed the way the pages were framed in yellowing age. I would wonder how many year that took to happen; how old you'd needed to be to own a book that had turned yellow... Then, in the low light, I'd sink back into the adventure, still aware of the darkening edges cupping the words like, hands full of water, on the page. Now, unlike most grown-ups, each year I suffer that same, sad, downward tug at my heart as the school year stands only a tomorrow away from me. And as I wait, inhaling the coquettish scent of fall that teases the time for school, I then exhale and look at the book I am now re-reading; a book that hand-holds its reader barefoot through the grass of summer into the day before the stiff new shoes of September have to cage the toes: Ray Bradbury's Dandelion Wine. And I feel the hearts of Douglas and Tom Spaulding as their summer of 1928 closes like my Grandmother's old barrel. I feel like a boy each year at this time, filled with the leaden resignation that the freedoms of July and August are soon to be no more. The bookshelf is mine, now, and it stands in my living room, filled with books of poetry. Some day, my sons will find Keats there. Or Sandburg or Heaney. But the men in the life raft have long since gone to dust.